Nobody puts Paul in a cage. 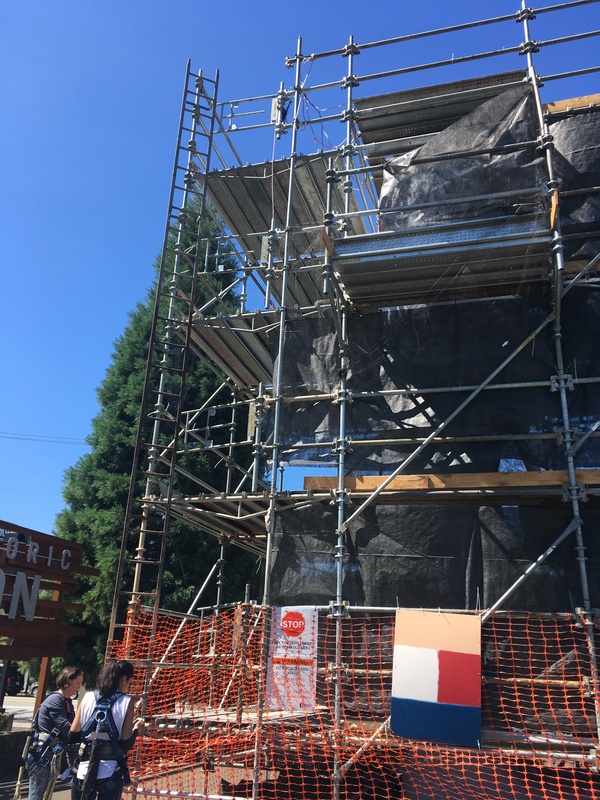 On a sunny day just after noon I was inspired and exhilarated to see the face of Paul Bunyan, the Kenton neighborhood’s only celebrity Roadside Attraction peeking out from the top of scaffolding. This wasn’t the peeling, sooty faced Bunyan of the past few years. This was a freshly painted version, his hat hidden dutch boy hairstyle and trimmed beard now gleaming with jet black paint. Paul’s cleaned up appearance and piercing blue eyes are giving him a youthful look. The haggard appearance of the past few years is now a memory. Even his red hat pom sparkled in the sunshine. Paul’s been given what everyone could use, a fresh start. This is only the beginning but starting at the head seems appropriate. 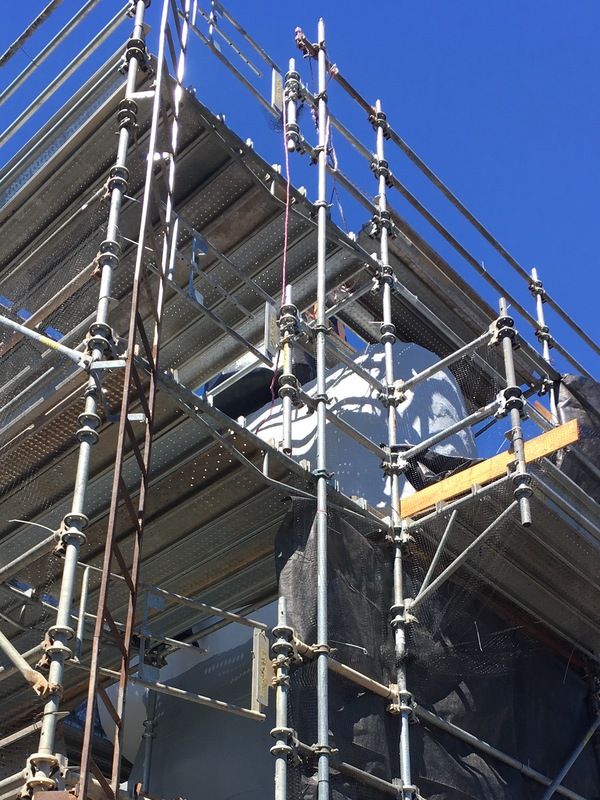 It’s the only thing that can be seen through the scaffolding. Knowing that his mischievous grin is right below a platform and soon to be unleashed encourages me. Good things happen through perseverance. Trained scaffold experts at work. I was told by one of the harness wearing workers that the top down approach is being employed in the painting process. This helps since Paul has already had some paint spilled on his shoulders. As the painting continues there will be a curing process leading up to the reveal event on Saturday, September 9th. I can’t emphasis enough how sad and shabby Paul was. Between the dirty forearms, chipped paint and bare patches, especially on his boots, he had fallen on tough times. He was never in the position to go to a tailor for new clothes or get down the street to the laundromat where they have a nice large capacity washer seemingly up to any task. The fund raising campaign for the project is still active but summer’s dry weather proved to be the best time to start and complete the project. 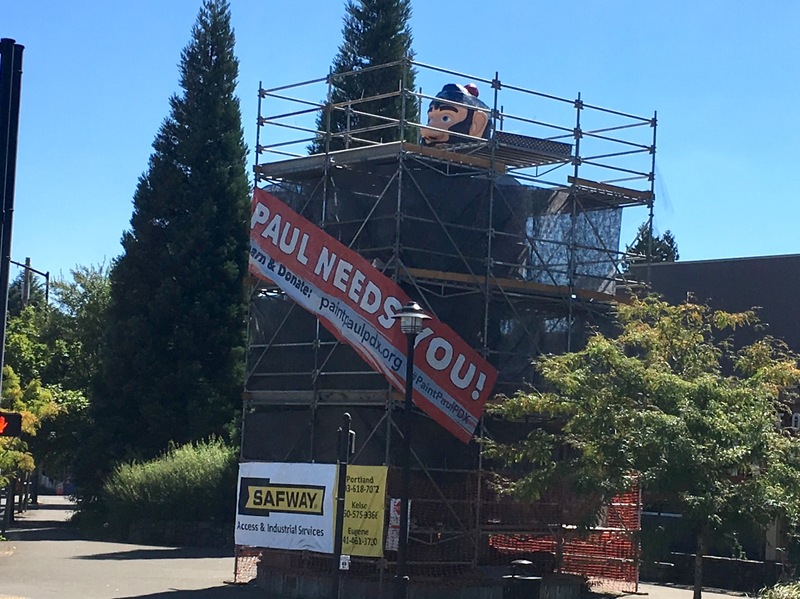 Please consider helping pay off Paul’s renovation. He deserves a break. He waited a long time to be cleaned up. He’s still waiting to be suited up with fresh duds. 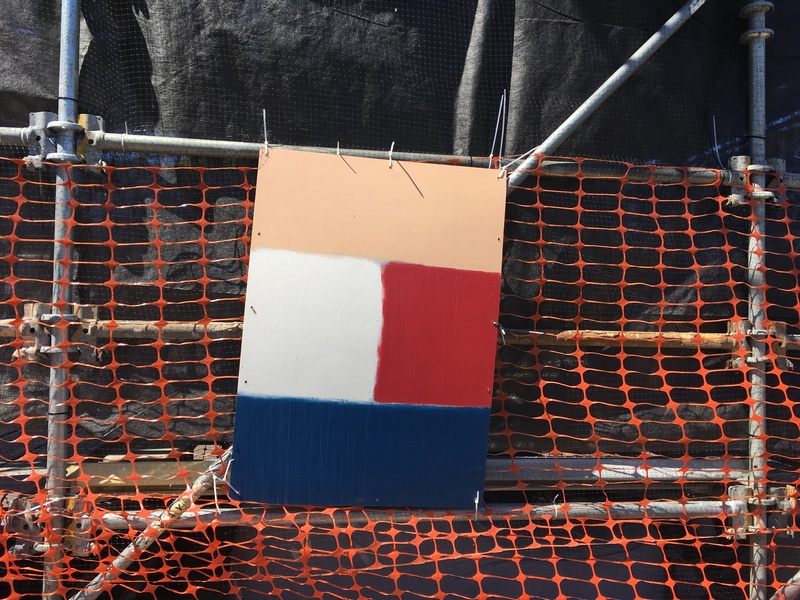 After spending the better part of a year, since the fundraising campaign began, crumbling, with his skin sloughing off and getting increasingly grimy, it became obvious that the painting couldn’t have started soon enough. The scuffed up boots, despite his inability to walk anywhere, keep me hanging on for the promise of those new boots for Paul. Editor’s note: Many of you tuned in this week expecting to read about owls. Our apologies. When breaking news like this happens, owls take a back seat. We won’t forget the owls and will return with an owl post soon. This August has actually become less of a slow news month than usual. The owl report has been postponed until September. Your patience in this matter is much appreciated. Glad to hear Paul’s makeover is going well! It’s happening. Things were looking real shabby around the neighborhood so this will inspire everyone to clean up their acts.